Our day began with breakfast in the hotel, which is different than America. We had to choose from a buffet of croissants; some fruit, yogurt, and bread. They served juices, and all sorts of coffee. Normally in Italy they have cappuccino with breakfast, which is only usually served until 12 PM. After breakfast, we had to checkout of the hotel and then ride the shuttle back into the city of Rome for our second day of touring. Our day was filled with sightseeing, including tons of monuments. 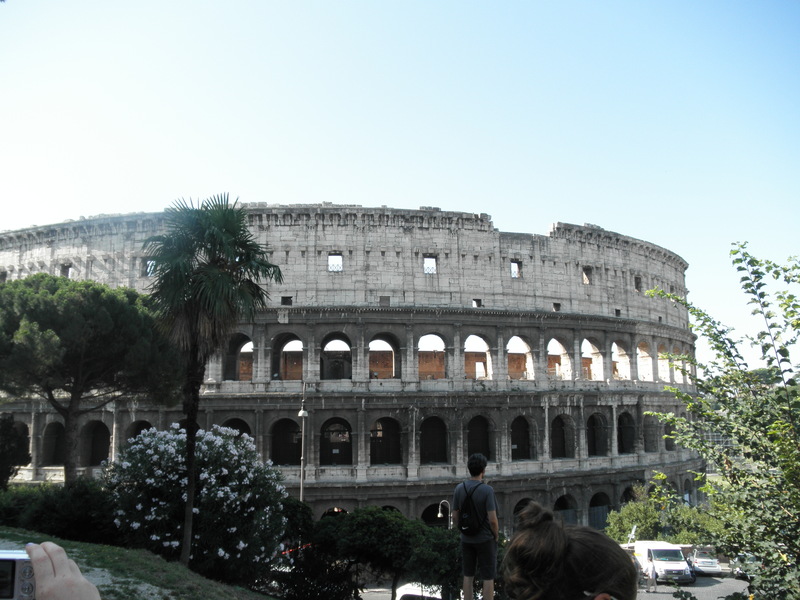 The Coliseum was the first famous monument of the day, which, by the way, was a lot bigger than I thought. We also got to see the Forum Ruins, and the Spanish Steps. 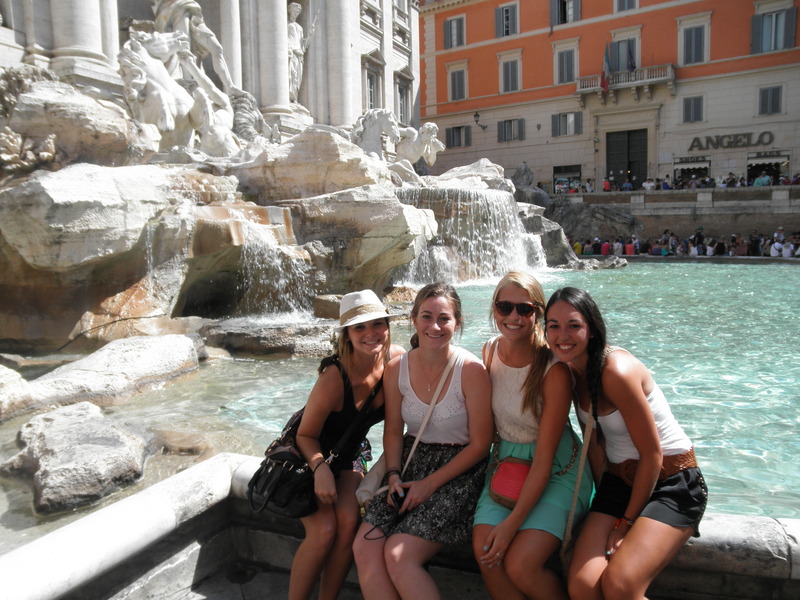 My favorite part was going to Trevi’s fountain, which is the famous fountain for wishes. Our tour instructor told us you have to stand with your back to the fountain and throw the coin with your right hand over your left shoulder. The first coin is to return to Italy, the second coin is to make a wish, and the third coin is to fall in love. Hopefully we will have the pleasure of all three coming true!!! 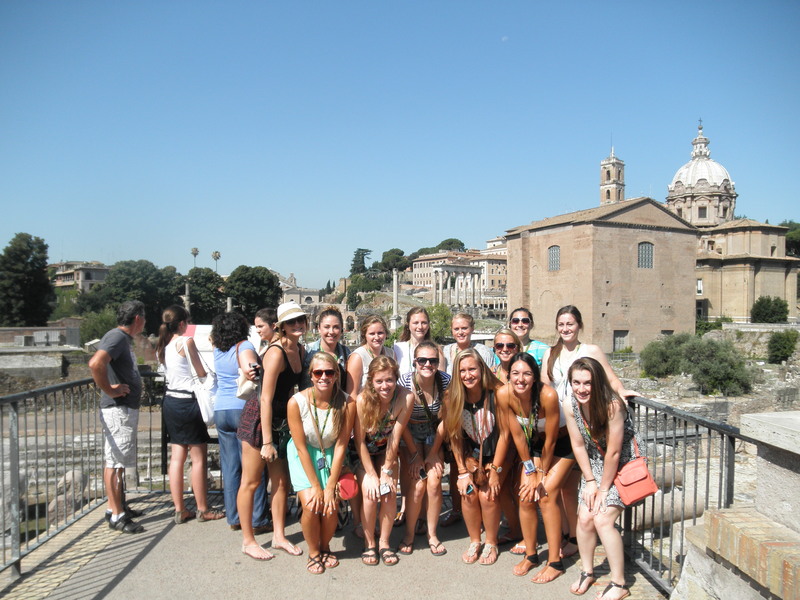 After our sightseeing tour, we had a few hours of free time to explore the shops of Rome. I went to lunch with some of the girls, and we each ordered a margarita pizza pie! We finished everything!!! The pizza was much thinner and fresher (less grease) than at home. We also went into many shops where we got to purchase our first piece of clothing from Italy! After shopping we met at the shuttle bus and had to drive about 4 hours to Montacecini Terme, which is the location of the hotel we are staying at now. Thankfully this hotel has air conditioning! We had dinner at our hotel, Hotel Montebello, which was a four-course meal once again. Tonight our meal included: pasta with ham and cream sauce, salad, grilled beef and roasted potatoes, and tiramisu. After dinner, Juancarlo took us to The Hop Store, which is an Irish pub. It was a neat experience! Tomorrow we will tour Florence and the leather market, as well as our first training session with a professional Italian coach. Ciao! You girls must be having a BLAST! Thanks so much for blogging and the pics are great! Enjoy! The pictures are fantastic. Keep them coming, please. I don’t have to tell you to have fun, I can see it on all of your faces.